Not to be confused with Enteric bacteria. Family is one of the eight major hierarchical taxonomic ranks in Linnaean taxonomy; it is classified between order and genus. A family may be divided into subfamilies, which are intermediate ranks between the ranks of family and genus. The official family names are Latin in origin; however, popular names are often used: for example, walnut trees and hickory trees belong to the family Juglandaceae, but that family is commonly referred to as being the "walnut family". 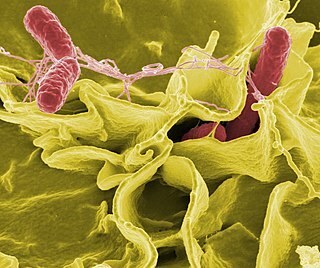 Enterobacteriaceae includes, along with many harmless symbionts, many of the more familiar pathogens, such as Salmonella , Escherichia coli , Yersinia pestis , Klebsiella , and Shigella . Other disease-causing bacteria in this family include Proteus , Enterobacter , Serratia , and Citrobacter . Phylogenetically, in the Enterobacteriales, several peptidoglycan-less insect endosymbionts[ citation needed ] form a sister clade to the Enterobacteriaceae, but as they are not validly described, this group is not officially a taxon; examples of these species are Sodalis , Buchnera , Wigglesworthia , Baumannia cicadellinicola , and Blochmannia , but not former Rickettsias. Members of the Enterobacteriaceae can be trivially referred to as enterobacteria or "enteric bacteria",  as several members live in the intestines of animals. In fact, the etymology of the family is enterobacterium with the suffix to designate a family (aceae)—not after the genus Enterobacter (which would be "Enterobacteraceae")—and the type genus is Escherichia . Symbiosis is any type of a close and long-term biological interaction between two different biological organisms, be it mutualistic, commensalistic, or parasitic. The organisms, each termed a symbiont, may be of the same or of different species. In 1879, Heinrich Anton de Bary defined it as "the living together of unlike organisms". The term was subject to a century-long debate about whether it should specifically denote mutualism, as in lichens; biologists have now abandoned that restriction. 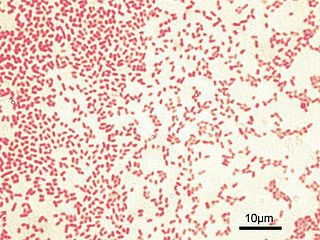 Members of the Enterobacteriaceae are bacilli (rod-shaped), and are typically 1–5 μm in length. They typically appear as medium to large-sized grey colonies on blood agar, although some can express pigments (such as Serratia marcescens). Most have many flagella used to move about, but a few genera are nonmotile. Most members of Enterobacteriaceae have peritrichous, type I fimbriae involved in the adhesion of the bacterial cells to their hosts. Like other proteobacteria, enterobactericeae have Gram-negative stains,  and they are facultative anaerobes, fermenting sugars to produce lactic acid and various other end products. Most also reduce nitrate to nitrite, although exceptions exist (e.g. Photorhabdus ). Unlike most similar bacteria, enterobacteriaceae generally lack cytochrome C oxidase, although there are exceptions (e.g. Plesiomonas shigelloides ). Lactic acid is an organic acid. It has a molecular formula CH3CH(OH)CO2H. It is white in solid state and it is extremely soluble in water. Solubility is so high that 1 part of lactic acid can dissolve 12 parts of water. While in liquid state (dissolved state) it is a colorless solution. Production includes both artificial synthesis as well as natural sources. Lactic acid is an alpha-hydroxy acid (AHA) due to the presence of carboxyl group adjacent to the hydroxyl group. It is used as a synthetic intermediate in many organic synthesis industries and in various biochemical industries. The conjugate base of lactic acid is called lactate. 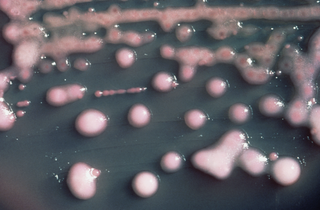 Catalase reactions vary among Enterobacteriaceae. Many members of this family are normal members of the gut microbiota in humans and other animals, while others are found in water or soil, or are parasites on a variety of different animals and plants. In evolutionary biology, parasitism is a relationship between species, where one organism, the parasite, lives on or in another organism, the host, causing it some harm, and is adapted structurally to this way of life. The entomologist E. O. Wilson has characterised parasites as "predators that eat prey in units of less than one". Parasites include protozoans such as the agents of malaria, sleeping sickness, and amoebic dysentery; animals such as hookworms, lice, mosquitoes, and vampire bats; fungi such as honey fungus and the agents of ringworm; and plants such as mistletoe, dodder, and the broomrapes. There are six major parasitic strategies of exploitation of animal hosts, namely parasitic castration, directly transmitted parasitism, trophically transmitted parasitism, vector-transmitted parasitism, parasitoidism, and micropredation. 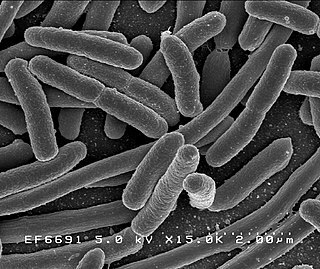 Escherichia coli is one of the most important model organisms, and its genetics and biochemistry have been closely studied. Some enterobacteria are important pathogens, e.g. Salmonella, Shigella, or Yersinia, e.g. because they produce endotoxins. Endotoxins reside in the cell wall and are released when the cell dies and the cell wall disintegrates. Some members of the Enterobacteriaceae produce endotoxins that, when released into the bloodstream following cell lysis, cause a systemic inflammatory and vasodilatory response. The most severe form of this is known as endotoxic shock, which can be rapidly fatal. Methyl red or Voges-Proskauer tests depend on the digestion of glucose. The methyl red tests for acid endproducts. The Voges Proskauer tests for the production of acetylmethylcarbinol. Catalase test on nutrient agar tests for the production of enzyme catalase, which splits hydrogen peroxide and releases oxygen gas. Oxidase test on nutrient agar tests for the production of the enzyme oxidase, which reacts with an aromatic amine to produce a purple color. Nutrient gelatin tests to detect activity of the enzyme gelatinase. In a clinical setting, three species make up 80 to 95% of all isolates identified. These are Escherichia coli, Klebsiella pneumoniae, and Proteus mirabilis. Marbofloxacin is a carboxylic acid derivative third generation fluoroquinolone antibiotic. It is used in veterinary medicine under the trade names Marbocyl,Forcyl and Zeniquin. A formulation of marbofloxacin combined with clotrimazole and dexamethasone is available under the name Aurizon. Enrofloxacin (ENR) is a fluoroquinolone antibiotic sold by the Bayer Corporation under the trade name Baytril. Enrofloxacin is currently approved by the FDA for the treatment of individual pets and domestic animals in the United States. In September 2005, the FDA withdrew approval of Baytril for use in water to treat flocks of poultry, as this practice was noted to promote the evolution of fluoroquinolone-resistant strains of the bacterium Campylobacter, a human pathogen. Ceftibuten is a third-generation cephalosporin antibiotic. It is an orally administered agent, with two dosage forms, capsule or oral suspension. It is marketed by Pernix Therapeutics under the trade name Cedax. Viable but nonculturable (VBNC) bacteria refers to bacteria that are in a state of very low metabolic activity and do not divide, but are alive and have the ability to become culturable once resuscitated. Tevenvirinae is a subfamily of viruses in the order Caudovirales, in the family Myoviridae. Bacteria and archaea serve as natural hosts. There are currently 54 species in this subfamily, most included in 11 genera. ↑ "List of genera included in families - Enterobacteriaceae". List of Prokaryotic Names with Standing in Nomenclature. Retrieved 26 June 2016. ↑ Don J. Brenner; Noel R. Krieg; James T. Staley (July 26, 2005) [1984 (Williams & Wilkins)]. George M. Garrity, ed. The Gammaproteobacteria. Bergey's Manual of Systematic Bacteriology. 2B (2nd ed.). New York: Springer. p. 1108. ISBN 978-0-387-24144-9. British Library no. GBA561951. ↑ MacFaddin, Jean F. Biochemical Tests for Identification of Medical Bacteria. Williams & Wilkins, 1980, p 441. ↑ Centers for Disease Control and Prevention - Klebsiella Quotation: "Increasingly, Klebsiella bacteria have developed antimicrobial resistance, most recently to the class of antibiotics known as carbapenems." Wikimedia Commons has media related to Enterobacteriaceae .